Travellers on a controversial green belt site in the West Midlands are being allowed to partly develop it. They have been given permission to fence off a pond and put down sewage pipes for 10 caravans at Eaves Green Lane in Meriden, near Solihull. But protesters want it postponed until Solihull Council planners decide on the overall site's legality on 7 July. Villagers have picketed the site to prevent development since the travellers arrived on 30 April. 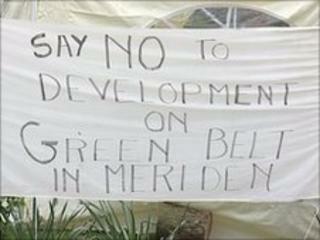 Councillor Ian Hedley, the leader of Solihull Council, said the authority was allowed to permit basic development. Although the council won an interim injunction barring development on the site until the planning application was heard, Mr Hedley said it could allow some work on humanitarian grounds. If the council planning committee rejected the application for a site and the travellers appealed, they could be there for at least another six months. Mr Hedley said: "There was a humanitarian justification with sanitation and fencing off the pond for the safety of children." However, he added that it would be "a step too far" to allow any building materials to be put down on the site. Dave McGrath from Meriden Residents Against Illegal Development said: "This site is neither established, permitted or tolerated. "A temporary solution such as portaloos would be much better."